Check out our post-marathon survey responses! Whether or not you're a marathoner, we invite recreational runners of all abilities to join our community by subscribing to the HCMC e-mail listserv. Who knows? After awhile, you just might end up being a marathoner, or a half-marathoner, after all! 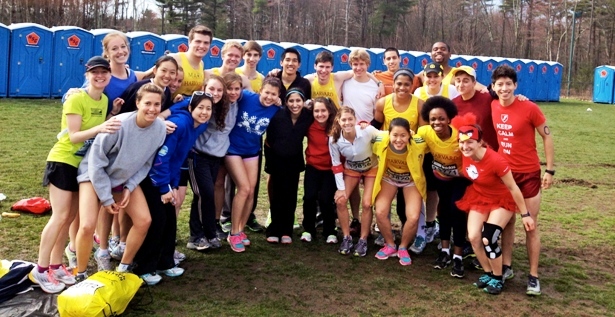 Harvard College Marathon Challenge (HCMC) is an organized group of Harvard students, employees, and alums that raises money, through running, to benefit the health, education, and welfare of Boston-area youth and families. Since its inception in 2005-06, HCMC runners have raised over $782,000 for causes such as the Phillips Brooks House Association (PBHA), Project HEALTH, and the American Medical Athletic Association (AMAA). In 2019-20, by virtue of their fundraising efforts, our official HCMC participants will be among the lucky few to earn invitational charity entries to run the 124th Boston Marathon on Monday, April 20, 2020 (Patriots' Day). Between now and then, participants will meet and train with other Harvard runners, including many who are not running in the Boston Marathon but who just want to run with other Harvard community members.